I am please to announce a new WordPress plugin which allows you to peek under-the-hood at the new cache in WordPress v2.0 (and v2.0.1) and to see what it is doing. A semi-transparent window is displayed for the admin user at the top right hand corner of your blog. It also allows the admin user to easily clear the cache from within the WordPress adminitration interface. This is the number of cached items that were loaded from disk. 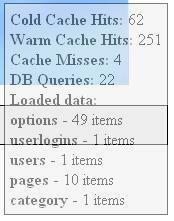 This is the number of items that had to be fetched from the db as they were not in the cache. This lists the type and amount of data loaded into memory from that currently stored within the cache..
Head on over to the wp-cache-inspect page for more info and to download.